Saxophone player Hank Mobley was born in Eastman, Georgia, on July 7, 1930. He died on May 30, 1986, in Philadelphia, Pennsylvania. During the intervening years, he became one of the greatest proponents of hard bop jazz has seen. Unfortunately, that fact was not always appreciated while he was still alive. Mobley grew up in Elizabeth, NJ, and it was there that he learned to play the piano as a boy. When he was 16, he switched to the saxophone and shortly thereafter began playing professionally. When he was in his late teens, on a recommendation from Clifford Brown (who knew Mobley only by reputation), Paul Glayten hired Mobley in 1949 for his R&B band. The band at that time included Cecil Payne, Aaron Bell, Sam Woodyard, and JFASN #54 subject, Clark Terry. During 1958 and 1964, Mobley spent time behind bars because of his ongoing problem with drugs. When he wasn’t locked up, he created some of the era’s most enduring recordings and played with or worked for some of its biggest stars. Some of the luminaries he recorded or appeared live with were Cedar Walton, Max Roach, Milt Jackson, Tad Dameron, Dizzy Gillespie, Art Blakey, Walter Davis Jr., Slide Hampton, Lee Morgan, and J.J. Johnson. Hank Mobley released a large number of albums during his career, and the one I want to talk about this time ’round is his 1961 Blue Note release, “Another Workout”. This is one of those rare albums that has no sidemen. Every artist who took part in this recording was, or went on to be, a well-respected leader in his own right. The version of this CD that I have includes five songs. Three of them are Mobley originals, including the opener, “Out Of Joe’s Bag”. This one bops hard from the first note. The guys really hit this one hard and just keep hitting it. “Out Of Joe’s Bag” could possibly have been the quintessential hard bop song of all time if the jazz cognoscenti of the age had had the ears to hear and the wit to appreciate Mobley’s talent. Track two is a beautiful ballad entitled “I Should Care”, a standard penned in 1944 by the songwriting trio Sammy Cahn, Axel Stordahl and Paul Weston. This song has been performed over the years by a wide variety of artists, including Bing Crosby, Barry Manilow, Thelonious Monk, Abbey Lincoln, and The Four Freshmen. It would be hard for me to envision that any of those versions were more beautiful than the one Mobley and company give us here. I was not able to find any videos online from “Another Workout”, but there are an impressive number of others featuring Mobley. Here is one with basically the same group that made “Another Workout”, with the exception that in the video, the drummer is Art Blakey. This is from Mobley’s 1960 album, “Soul Station”. “Gettin’ And Jettin'” is up next. This is the second of three Mobley originals we are treated to on this disk, and is a sort of “in-between” song. It lacks the hard-driving impetus of the opening number but certainly is livelier than “I Should Care”. If you listen carefully, you can hear one of the musicians doing a little impromptu vocalizing in the background, the sign of a true artist throwing his all into the performance. “Gettin’ And Jettin'” is a superb piece of music and you will love it. “Hank’s Other Soul”, the final of Mobley’s compositions on this album, opens quietly. Only Philly Joe Jones on the drums and percussion adds a hint of hot passion to what is otherwise a wonderful piece of quiet but warm bop. The pace gradually picks up. At 8:45, this is the longest song on the album and I predict you will find that when it ends you will find yourself wanting more. Here is another 1960 Mobley classic, “My Groove Your Move” from his album “Roll Call”. This one includes Freddie Hubbard on trumpet, Art Blakey on drums, Wynton Kelly on piano and Paul Chambers on bass. The final track is the classic “Hello Young Lovers”, written by Oscar Hammerstein II and Richard Rodgers for the Broadway musical, “The King And I.” It provides this album with and ending that is both familiar and at the same time not entirely predictable. 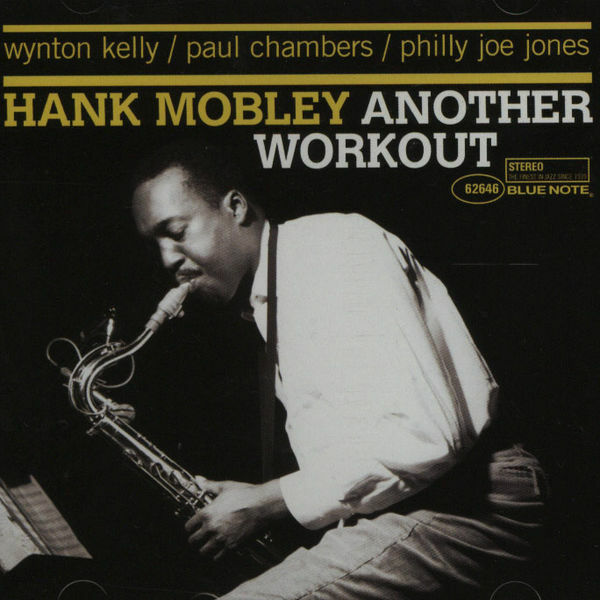 I really enjoy listening to Hank Mobley’s “Another Workout”, and I am certain that you will find it a wonderful addition to your personal playlist for a Saturday, or any other, night! You can learn more about saxophonist Hank Mobley by reading Steve Huey’s biography of him on allmusic.com, here. The hard bop homepage has a nice bio of Mobley borrowed from Bob Blumenthal’s liner notes for “The Complete Blue Note Hank Mobley Fifties Sessions”. Much of Mobley’s music is available for purchase and/or legal download at all the usual places.